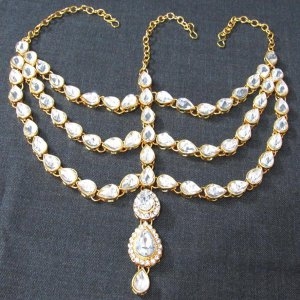 The Maang Tikka is one of the prime jewellery which is mostly used by Indian brides during the time of their marriages. An Indian bride is incomplete if she is not wearing a Maang tikka. Basically, a Maang tikka is a constituent of jewellery that has a nice and designed hanging trinket on the hairline of the woman. Maang tikka design is old bridal jewellery which women have been using it as one of the major accessories to make themselves look like a beautiful bride. Maang tikka set makes women look more glamorous and beautiful. There are many varieties of maang tikka set. Some of the very famous maang tikka designs are the side maang tikka, maang tikka with side string, maang tikka with chain and maang tikka without chain. It is not mandatory that a maang tikka can only be worn on the occasion of marriage; women wear it as a piece of jewellery so it can be worn on any event like marriage function or any festive occasion on lavish Lehengas or Saree styles. 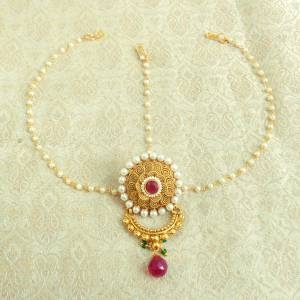 The astounding maang tikka jewellery is a historically designed ornament. It connects great science due to it’ shape and designs and the way it was worn. According to the Hindu mythology, the forehead is the place of the sixth chakra of kundalini and is responsible for the control of emotions and feelings. And the accurate positioning of the maang tikka is forehead itself. It is believed by the ancient science that it even helps women to control the power of concentration and the flow of emotions. A maang tikka also represents the third eye of the women which works as to see and judge the emotion and feelings. From the prehistoric time of the Harappan civilization, women are using stylish maang tikkas of numerous varieties. A lot many maang tikka designs are being taken from the ancient pictures and sculptures. Maang tikka signifies that even in the history of the fashion world, maang tikka was very famous and was used by both the genders. 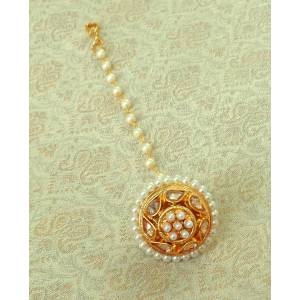 And nowadays the vintage ornament is becoming very popular within every class and standards of people. Every Indian woman wants to be out of the crowd when its time of a marriage function, festival occasion, and any party gathering. For being the astounding one, a woman must understand a proper dress code and must know about matching a dress, wearing exact matching and attractive jewellery. 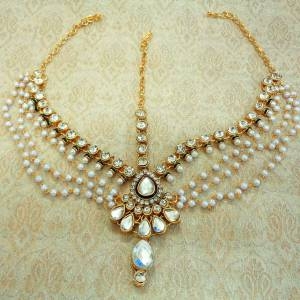 Maang Tikka is one of the most prominent jewelry which must be chosen very consciously. There are some categories of the maang tikkas like Muslim maang tikkas, Hindu maang tikka, Jhummar tikka, Kundan Tikka, wedding maang tikka, etc. Before buying one, you must understand first that what exactly you are looking for then only you will be able to appear as beautiful as you have looked never before! Buy maang tikka online in India is one of the best factors of the modernizing world. One facility had made everything so comfortable and convenient to everyone that now everyone prefers to shop everything online. There are some common factors to be remembered when you shop online because even there is some fraud seller or not so good sellers who can deliver wrong order and even may deliver the poorest quality product. To avoid this kind of issues, you should always buy products from a trusted and verified seller by the online assures. Craftsvilla will give you everything in one click. You just log in to the website craftsvilla.com or download the smartphone application and you will be secured from all the tensing frauds done by online sellers. Craftsvilla provides only verified and genuine products with 100% returns. You may easily find hundreds of variant of Maang tikka designs. 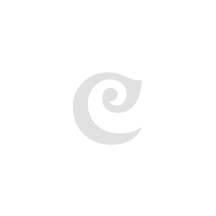 Craftsvilla offers you maang tikka online shopping in India and even out of India. We have almost every maang tikka design. Our most popular designs are Maang Tikka for round face, latest Maang Tikka design, Round shaped Maang Tikka designs for round face and suited the women who all have a nice circular face structure. Side Maang Tikka is made for every woman who is fond of wearing maang tikka. Maang Tikka with side string is a remark of fashionable maang tikka, and it gives out a perfect and unique appealing appearance. Maang Tikka without chain is one of its kind and reveals the sober and the simple ethnic look which will make women look more decent and beautiful. Maang Tikka set is a fully loaded piece of art, it has optional attachment that can be d-attachable and tikka can be shortened. 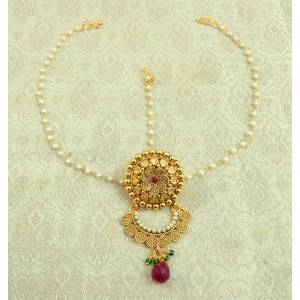 Maang Tikka with chain is a tremendously fashionable piece of art and ornament. Its chains are stretched from forehead to backhead and give a unique look. There are a lot many varieties of bridal Maang Tikka designs, wedding Maang Tikka, heavy Maang Tikka and stylish Maang Tikka. Buying a Maang Tikka online in India is not an issue but to buy maang tikka online with 100% security and assurance is a big deal. So, always prefer the assured sellers. Then only your Maang Tikka online shopping could result out a happy experience and you won’t have any regrets about doing it. Maang Tikka online shopping is not an easy task because sellers sell the worst quality or the material used to design the maang tikka. We at Craftsvilla only deliver the exact and same article as shown in the pictures on the website and application. Even we have hundreds of maang tikka designs which you may not find everywhere. We assure you for money back and product return if you don’t like our latest maang tikka designs. So let us have a chance to serve you with our genuine and generous service!